I've been back in the studio for a week now. Wednesday to Friday brought a fair amount of friends, well-wishers and folks who needed some pottery in the front door. It's now settled down to my old routine and today I got to throw. It was sweet. There is just something magical about watching that clay change from a mound to a vessel. It still gets to me, even when it's me doing it. 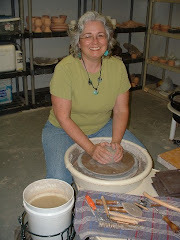 Lots of thoughts about the studio were whirling around as the pots came off the wheel. I have decided to go through all my STUFF. If it were a little pile of stuff, there would be no need to use capital letters. Obviously I have acquired more than I need and I intend to fix that by redistributing the wealth. Check in here for updates on what will be offered (very reasonable prices and some free stuff) as I reduce my studio footprint. And hey, it's not just for pottery making people. There will be books, sewing/craft items, storage and display units, etc. Projected date is September 25.